The Nissan ESFLOW electric concept car on display at the Tokyo Motor Show is the culimination of Nissan’s belief that it is possible to combine zero emissions with driving power and pleasure. Along with the Nissan Nismo Juke world premiere and the Nissan PIVO 3 concept, the ESFLOW shows that Nissan is willing to put its money where its mouth is in developing an innovative range of vehicles. The Nissan ESFLOW combines the sports heritage so important to the Nismo Juke with the ecological commitment of the Nissan PIVO 3. What does a zero emission sports car look like? The two-seater ESFLOW displays the design flair expected from the Nissan team, mixing classic sports car elements with futuristic touches such as the slashed-style lights. With its low profile tyres, spoked wheels, long bonnet and wrap-around windscreen, the Nissan ESFLOW immediately evokes the racetrack. Glaciers inspired the colour scheme, giving it a glamorously cool edge. 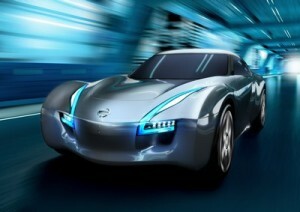 The clarity and sleekness of the design is made possible by building it around the needs of a zero emission powertrain. What sort of performance does the Nissan ESFLOW give? The ESFLOW is a rear-wheel drive, with twin electric motors driving the wheels. As it’s possible to control each wheel individually, torque is optimized, giving the driver exceptional control. 0 to 62 mph is achieved in less than five seconds, proving that electric isn’t just for urban run-arounds. This misconception is further destroyed with the Nissan ESFLOW’s ability to tackle journeys of up to 150 miles on a single charge. While the ESFLOW uses the same lithium-ion batteries at the Nissan LEAF, they are positioned differently, above the axis of the wheels. This gives the car enviable poise and weight-balance. What about the car’s architecture? The lightweight aluminium chassis is designed around the drive train, and incorporates an unobtrusive roll cage. This does away with A-pillars and the blind spots associated with them. The Nissan ESFLOW’s luxurious and tactile interior features eye-catching gold trim and leather and suede seats. The driving console and instrument panel continue the clean, sophisticated lines and colours featured in the exterior. All in all, the Nissan ESFLOW shows how pioneering technology and design could continue to create desirable sports cars, without sacrificing the environment. Keep yourself updated with the latest news, previews and photos from the Tokyo Motor Show by liking us on facebook, following us on twitter or connecting with us on LinkedIn.